CNN has decided to cancel Piers Morgan Live after a three year run. Morgan broke the news in an interview with David Carr of The New York Times. He said, “It’s been a painful period and lately we have taken a bath in the ratings” and noted that the final episode would likely end in March. Morgan is expected to stay at CNN in some capacity. It’s unclear what CNN will do with the 9pm hour. When ABC News Nightline anchor Bill Weir was hired by the cable channel late last year, it was rumored that he might replace Morgan. At the time, CNN denied he was a replacement. What do you think? Did you like Piers Morgan Live? Are you sorry that it’s been cancelled? Would you watch another Morgan-hosted show? 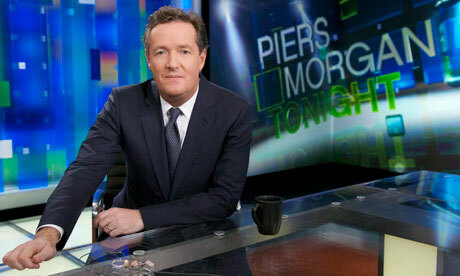 More about: Piers Morgan Live, Piers Morgan Live: canceled or renewed? I will miss Piers Morgan! He may have been a tad overbearing in talking over his guests, but he was a very knowledgeable interviewer and had, to my mind, the best of the best of intentions for America. I do wonder if the NRA and their unbelievable power over government extended their opinion to CNN who caved into their pressure. We know Piers’ opinion on guns – and I agreed. How can you control guns by having MORE guns? I, too, would watch anything that Piers Morgan hosts. CNN has made a mistake in my opinion. CNN big mistake to cancel Pierce. Was best one in nite lineup along with Anderson Cooper show. CNN execs fill in w boring traveler Boudain. Yuk. I do think the NRA got to CNN over Piers Morgan. What is with this Anthony Bourdain show? This is not a news show. CNN is a news show. Time to get your act togather. I liked Piers Morgan very much! He is a skilled interviewer –better than Larry King, in my opinion. I looked forward to his show and am sorry it has been cancelled !! We looked forward to his program and thought he did a great job forcing the issue of gun control front and center. Bring him back in some format. We thought he really got to the truth with his interviews. We can’t imagine why his ratings were down. Hope to see you soon Piers. GOOD! He was a total jerk… if you don’t like our policies here, go back where you came from. That actually goes for anyone else, too! Rose, you need to read Lee Giblin’s post above. You seem to be exactly the kind of person she is talking about, who seems to feel that if you’re not American, then you shouldn’t have an opinion. Because he disagrees with some things, he should go back home? Do you really think all your American policies are good? Grow up will you? Piers Morgan was “a stupid stupid man,” and I am glad the Limey p***k will be gone! He uses his freedom of speech to bash his host nation’s values? What a jerk! Will not miss him–too biased in his left wing view points that obscured his understanding of the issues. I have never felt Mogan really relate with how American news should be delivered. His attitude from his start made him unpopular. This was inevitable, I just hope CNN can find some real talent now that can deliver the news with more of an open mind. Did not like Piers Morgan’s attitude or style, therefore I did not watch. I used to watch Larry King a lot. Larry could be rather brusk, but at least he had some interesting shows. I liked him on AGT! I will miss Piers Morgan Live. I thought the show was candid, honest and he certainly held people accountable. I would definitely watch any show he may host in the future.